Action from Worthing Raiders v Barnes on Saturday. Picture by Stephen Goodger. Worthing Raiders assistant coach Ben Coulson felt blaming injuries in their 39-31 home defeat against Barnes in National League 2 South on Saturday would be 'disrespectful' to the opposition. Skipper Liam Perkins was ruled out before the match had begun, while Kemp Price and Jack Forrest came off injured in their loss at the weekend. Coulson said: "While injuries are frustrating they are a part of the game and it would be disrespectful to Barnes to say we'd have won if our injury list was shorter, although it's an exercise in futility to suggest we were at full strength. "The players that stepped up were manful. They displayed all the characteristics a coach desires and as a collective we kept ourselves in contention until the last five minutes. "Realistically every team in the league will be suffering injuries at this stage. We can't suggest injuries were the reason for losing on Saturday, ultimately we didn't execute in the moments that defined the match." With the Raiders casualty list seemingly ever-growing, opportunities have been given to some of the younger members of their squad. Coulson has been impressed with the attitude of Raiders' youngsters but felt the current lack of National League experience had curtailed their performance. He added: "Our ability to complete when opportunities presented was missing in important moments, but you couldn't for a moment question the endeavour which was evident to all. Just a little more composure at critical times could have made the difference. "Having said this the average age of the squad on Saturday was approximately 23. You take Grant Gatford out and it gets below to nearer 22. "Experience is crucial to success. At present we are not overly laden with National League appearances, but flipping that, with youth comes a no fear, go from anywhere belief which is exciting to work with." 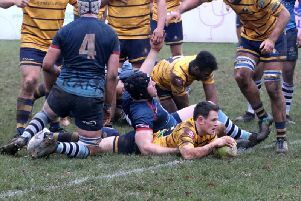 Raiders make the trip to Sonning, near Reading, to take on table-topping Rams on Saturday. 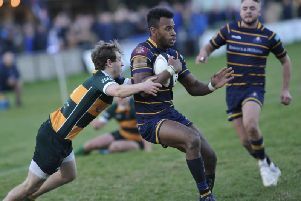 The Old Bath Road-outfit have 45 points from ten league games and the Raiders' are yet to pick up a victory at the Rams in three attempts. Ahead of their game on Saturday, Coulson is hopeful that a number of injured players will be returning in the near future but couldn't say for definite how many would be available at the weekend. He said: "It is early in the week, so with regards to Saturday we're not in a position to comment on the players that will and won't be available. "This being said we are hopeful that a number of important squad members will be coming back within the next couple of weeks. We'll continue to work with all the players, building confidence and continuity where possible."